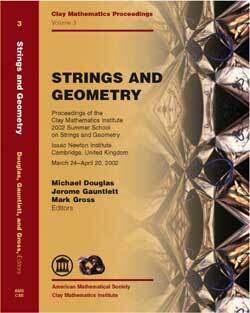 This volume is the proceedings of the 2002 Clay Mathematics Institute School on Geometry and String Theory. This month-long program was held at the Isaac Newton Institute for Mathematical Sciences in Cambridge, England, and was organized by both mathematicians and physicists: A. Corti, R. Dijkgraaf, M. Douglas, J. Gauntlett, M. Gross, C. Hull, A. Jaffe and M. Reid. The early part of the school had many lectures that introduced various concepts of algebraic geometry and string theory with a focus on improving communication between these two fields. During the latter part of the program there were also a number of research level talks. This volume contains a selection of expository and research articles by lecturers at the school, and highlights some of the current interests of researchers working at the interface between string theory and algebraic geometry. The topics covered include manifolds of special holonomy, supergravity, supersymmetry, D-branes, the McKay correspondence and the Fourier-Mukai transform.